Birds in Our Lives. Cover. 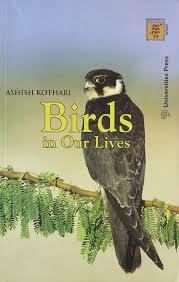 Kothari, Ashish. Birds in Our Lives. Hyderabad: Universities Press (India) Private Limited, 2007. © 2007 Ashish Kothari. Used with permission. The complete book is free to download courtesy of the author. Dunlap, Thomas R. “Thinking with Birds.” In: “The Edges of Environmental History: Honouring Jane Carruthers,” edited by Christof Mauch and Libby Robin, RCC Perspectives 2014, no. 1, 25–29. Lucas, Peter. "Valuing Birds in the Bush: For Pluralism in Environmental Risk Assessment." Environmental Values 11, no. 2 (2002): 177–91. doi:10.3197/096327102129341046.